Description: A plain bordered cross with a circular medallion in the centre depicting the effigy of St George and the Dragon after Benedetto Pistrucci, surrounded by the words FOR GALLANTRY. In the angle of each limb is the Royal cypher GVI. The reverse is plain. The cross hangs by a ring from a bar adorned with laurel leaves. 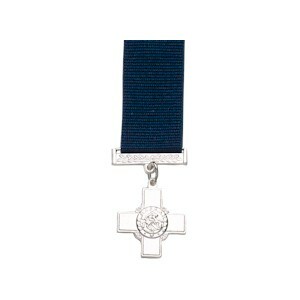 Comments: The George Cross is the highest gallantry award for civilians and for members of the armed forces in actions where purely military honours would not normally be granted. Perhaps the most famous cross was that conferred on the Island of Malta in recognition of its gallantry during the Second World War.